BUYING A POOR QUALITY REMOTE STARTER AND BRINGING IT TO GET IT INSTALLED AT ANOTHER PLACE. You can buy a remote starter at a number of places where they don't install them. Some will even come with a DVD for the DIYers. Don't make the mistake of purchasing poor quality NO-Name car starters on the internet, big box stores or flea markets. These brands have no tech support, parts or replacement remote controls. Most shops, including us, will NOT install a remote start that was purchased eleswhere. 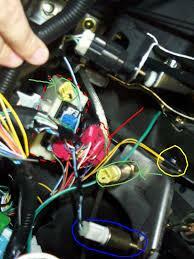 This, as it typically takes two to three times as long to learn a new brand, its quirks of wiring, programing etc. So if you can even find shop that will install your remote start it will ususally be a 2nd tier place, or a street installer crawling around outside in the snow! Most quality manufacturers of Remote Starters require professional installation and discourage over the counter sales. They know the odds of failure decrease when a professional does the work. We carry Compustar, Prestige and Directed Electronics (Viper, Clifford etc.) Think of it this way, Between our shops, we INSTALL more remote starters in W.Mass. than anyone! Over the past decades we've sampled many brands that have not performed well, and sell only quality Brands that supply spare parts, great tech support, Full warrantees and training for our MECP certified installers. DON'T TRUST YOUR CAR TO THE LOWEST BIDDER! Remote starters can offer a lot of convenience options, be sure to ask the right questions and read the fine print on special 'DEALS' offered in print and internet coupons. Low pricing ususally is simply what it sounds like: a remote start and NOTHING MORE! The advertisements fail to mention EXTRA HIDDEN CHARGES for remote control (s), required vehicle specific bypasses, factory alarm disarm, keyless entry, trunk release, rear defroster & heated seat turn on, and parking light notification while running. We've seen all of these added on at extra costs at other shops. The basic system might be good enough for you, but the common mistake is assuming that certain things in the car will 'just work with the starter.' No one likes surprises, the most common mistake is falling for the low advertised price and then finding out you need a "vehicle specific bypass' for up to $100 more! We always will quote our remote starters with the bypass, as 90% of cars DO require them and will not work properly without them PERIOD! Another common mistake is not adding keyless entry with factory alarm disarm. These are really a necesity that some shops charge extra for at the time of installation! On most newer vehicles the factory keyless entry does not funcition when the vehicle is running. So with a basic remote start warming up your car, you can't unlock your car(and disarm the factory alarm) with your factory remote! You would have to unlock the car before remote starting, or walk up to the car and use the key in the door. Niether is a good choice. So ask if the price includes UNLOCK W/ FACTORY ALARM DISARM and discuss All the above prefrences that can easily double an advertised internet coupon. A quality shop can talk you thru these options and make recomendations based on your prefrences and needs...If you find a shop you trust, the rest is easy. You really do get what you pay for. ADD THE DRONE TO ANY OF OUR RERMOTE STARTS FOR UNLIMITED RANGE! Not buying a remote car starter with enough range! Manufacturers have no choice but to put "500 feet' range, or "up to 1 mile range" ex. on thier packaging. Its important to keep in mind that these are not absolute numbers and are based in the open, no buildings to go around and no RF (radio) interference. In other words, line of sight on flat terrain. Basic Range is fine for most people wanting to start thier vechicle from upstairs or out in thier driveway from inside the house. This is where TRANSMITTER POWER becomes important. You can figure that the models with 500' adverstised range are the basic. Our 1500' model is considered 3X more strenth or power, and our 5000 ( 1 mile) models are 10X power. Don't shortchange yourself, You are going to use it in more places than just your driveway! You may have to park at work, 'way on the otherside of the building' when the snow starts flying! That's where the more powerful remotes would come in. Two way remotes communicate or confirm that the command has been received, and that your car did start and is now running, These are especially good when parked a great distance away or out of sight! 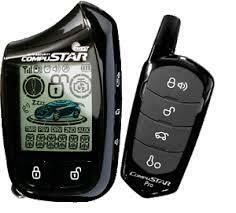 These more powerful transmitters will let you know if your car is running either by LED lights, or a LCD screen right on the remote control. 2 way remote starters are especially good when combined with a security system. If your car is tampered with or broken into, the remote will alert you from afar, as well as flashing lights and sounding the horn and sirean at the vehicle. 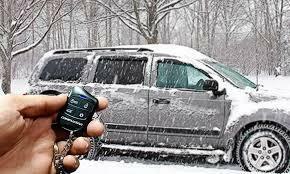 Command your remote start, keyless entry and security system from virtually anywhere! Your smartphone now becomes your 2-way remote! This is a great addition to any remote start, especially if you have to take the shuttle to the parking lot at work, or if you fly into the airport on late winter nights! You can start your car from the plane or before getting on your shuttle bus, and arrive to a warm de-iced car! Optionally, you can even track your vehicle real time, on your smartphone's GPS maps! For just $150, this gives you the ultimate long range addition to any remote starter. NOT HAVING YOUR REMOTE START PROFESSIONALLY INSTALLED. dollars of damage not covered under your vehicle's warranty. Shop at a well known, long established, fully insured, shop with regular hours and a good reputation for standing behind thier work. What's an extra $100 on a $10-40K vehicle for something that you expect to work several times a day for years! And by the way, a properly installed remote car stater will NOT VOID THE VEHICLES WARRANTEE, regardless of what the dealer says. It's the law!